Big international shows are a convenient way to meet and greet manufacturers from all over the globe and hear/see their new gear all in one place. Shazam! Small regional shows can be a convenient way to meet their country's smaller and bigger domestic makers if those opt to support it. As this year's Highend Suisse showed, that needn't be the case. Reasons for that can be insufficient attendance of press, dealers/distributors and prospective buyers; and/or unreasonably high exhibit fees. The precise mix of cost versus reward is the watershed determinant by which manufacturers try to determine attendance. Rewards are directly proportionate to how successful a show—or rather, its management—is at advertising itself to the largest possible audience. Launching a show and stuffing a hotel with exhibitors are both child's play compared to promoting the event successfully for the really big attendee numbers all exhibitors dream of. If the majority of attendees really are the manufacturers and their normal groupies and relatives, things are a bust. Then there is the third option: big regional shows. They promise international visitors, exhibitors from well outside their country plus a highly concentrated presence of regional talent. If such a show takes place in a country that's not widely considered a hot spot of audio activities—say India, Spain or Russia—it can get most interesting for visitors who fly in from abroad when in fact, said country turns out to be seriously deep into hifi. Poland's annual Warsaw show is just such a winning event. It attracts international visitors and exhibitors. It's big and spread out over two or three hotels depending on the year. And it's very well supported by domestic makers who are far more numerous than you might think. Adverts for this show insert as extra pages in Warsaw's daily newspaper a week prior just like a big circus coming to town would do it. And just like a circus provides entertainment for the whole family, so does this show based on actual attendee breakdowns. To attract international press coverage, show organizer Adam Mokrzycki extends expenses-paid invites to select journalists. That warrants a hurray. For foreign publications, show attendance can be a big drain on money and time. Meanwhile rewards are marginal at best. Review product is always just an email away. Product news can be and are disseminated by the manufacturers pre and post event. Doing proper show reports—i.e. not mere photo fests with nary a meaningful comment in sight—can take 5 days total to write, select and format just the right photos, vet for facts and finally publish. Added to travel and attendance days, this could mean a 10-day unpaid break from regular operations. Thank-yous from makers covered in show reports tend to be nil. Complaints about how we could possibly miss their cables or not like their sound however are legion. Ouch. 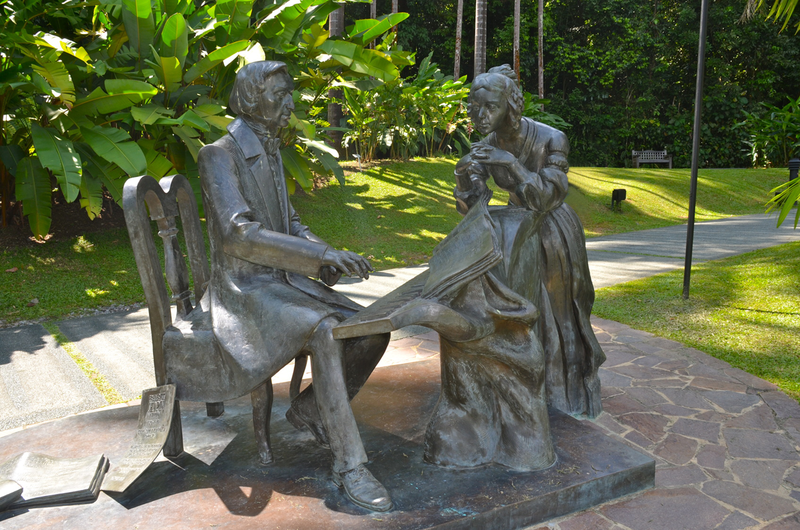 Statue dedicated to Frederic Chopin, Polish composer/pianist extraordinaire, but installed not in Warsaw or Krakow but faraway Singapore to really celebrate our domestic/international angle. Truly, show attendance for established magazines who no longer must spread the word on their mere existence is mostly about pro bono support of the industry which feeds them; and to enjoy rare face-to-face opportunities of interfacing with their advertisers. These two very good reasons must be balanced against the incurred business expenses particularly when shows take place abroad. That determines whether a given publication can afford to send more than one journalist (helpful to cover really big events) or any at all. And let's face it, there are many such shows today. For the well-informed journo, on actual product and brand discoveries shows are very often a repeat from the year prior. Meanwhile pre-show product announcements via email might cover the majority of what otherwise might have been surprises. In short, compelling the press to turn up in droves to anything other than the biggest must-see events—Munich in Europe, Las Vegas in the US, Guangzhou in China —isn't easy. That's further undermined by the preponderance of hifi blogs and web-based posters who often contribute intensively and in near real-time coverage on shows. Here Adam's standing offer to offset travel and room costs had me add his dazzling do to my annual show list of Munich and Zürich. I'd first covered his show in 2006. Marja & Henk had done it in 2012 and 2013. In our combined opinion, this event has long since become #2 in Europe right after Munich and way ahead of Milan, London, Paris, Brussels, Vienna, Zürich or Gotheburg. I personally would probably most credit Adam Mokrzycki's promotional chops and the resultant success for this rating; perhaps also less exploitative exhibitor pricing than the German HighEnd Society practices for Munich and Zürich; and lastly strong loyal support from Poland's sizeable hifi manufacturing sector. For non-Polish exhibitors, attendance here can open doors to post-Communist Russia and the large swath of blossoming Eastern European countries. With 2014's installation of the event being the 18th time—yep, I did say one-eight—and spreading out over three hotels, the Warsaw audio show clearly belongs to the very established and most successful examples of its kind. Gratulacje! In keeping with the big regional theme of this event, my coverage will focus on Polish products; and novelties from brands in the wider Eastern European region. Covering for example Avantgarde Audio's Zero.1 which bowed at the Munich 2013 show wouldn't fall within that scope even though it's a fabulous speaker which some Warsaw showgoers might never have seen or heard (of) before. Likewise for Naim's giant statement amplifier and other such fare despite possibly being their premier Polish showing. My beat would be doggedly domestic; plus personal novelties from the regionals. Without a focused strategy that spends quality time in some exhibits rather than covers them all in a mad drive-by dash, worthwhile show reports done by a single individual, of big shows held over just two days and in three locations, aren't really feasible.